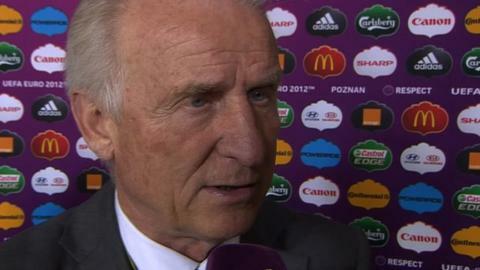 Republic of Ireland manager Giovanni Trapattoni insists his side's Euro 2012 hopes are not over after they opened with a 3-1 defeat by Croatia. The Republic were outplayed by Slaven Bilic's side in Poznan and are now bottom of a difficult group. They play Spain on Thursday before meeting Italy on 18 June. "We have to believe," said the Italian. "This evening we met a strong technical team. But every game in this tournament can be a surprise." Irish striker Kevin Doyle is also remaining optimistic, telling BBC Sport: "It is a setback for us but we perform well in difficult circumstances and that is what we will need to do. "It doesn't come more difficult than Spain and we will need our supporters to be shouting for us again." Defender Sean St Ledger, who scored his country's only goal against Croatia, believes the Republic can get a result against world and European champions Spain. "It is obviously going to be tough, but that's football," he said. "You are not going to go through tournaments unbeaten. You will lose some - Croatia are in the top 10 for a reason. "There is no better game to come next than Spain. Obviously we will relish the challenge of the world champions, so why not go and get a result?" Spain drew 1-1 with Italy in Sunday's earlier game, and the Irish are likely to need results against both these two if they are to progress beyond the group stage. Republic of Ireland manager Giovanni Trapattoni is the oldest coach to take charge of a European Championship finals match. The 73-year-old Italian beats the previous record held by Otto Baric, who was 71 when he led Croatia during Euro 2004. The Republic got off to the worst possible start in Sunday's game - their first in a European Championship finals since 1988 - when Mario Mandzukic gave Croatia a third-minute lead. Trapattoni's side equalised through St Ledger, but conceded again just before half-time when Nikica Jelavic chipped the ball in with Irish players calling for offside - appeals Trapattoni feels were vindicated. Mandzukic scored a second early in the second half to settle the game in Croatia's favour. The Republic were also denied a late penalty when Robbie Keane was brought down in the box by Gordon Schildenfeld. Keane felt referee Bjorn Kuipers' decision may have been influenced by the Irish not putting the ball out of play when a Croatia player lay injured in the build-up. "It's definitely a penalty, there's no question about that," said Keane. "Their players and their fans were shouting for us to kick the ball out but, before the ball got to me, I think the fellow stood up or was just about to stand up. "Whether the referee had that in the back of his mind, I'm not too sure. That's something you're going to have to ask him."